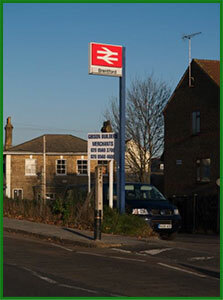 Brentford Station is one of the few step free stations in West London. It has good bus links, two lifts and drop off and pick up points. Despite all this, it is about to become inaccessible to wheelchair users and other disabled people. South Western Railway is threatening to reduce the number of guards they employ. 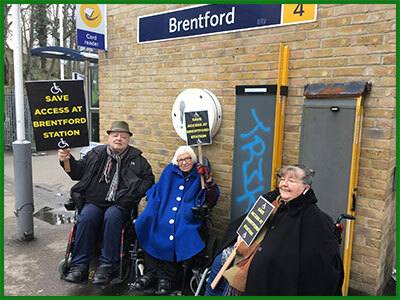 This will have an impact on all their unstaffed stations, not just Brentford. Why are guards so important to wheelchair users and other disabled people? The guard is the only person who can operate the ramp, which is needed for access for a wheelchair user. The ramp is either on the train or on the platform. The guard can also help other people on and off the train who might be having difficulties. 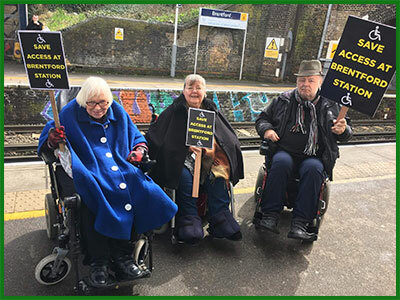 and join the demonstration at Brentford Station on Wednesday April 18th 2018 at 10.00am for a photo shoot and then a train journey to Waterloo Station to continue the demonstration.